For the past 2 days, I spent about 4 hours baking, 10 hours decorating, 2 hours packaging (and a couple of hours cleaning and washing up) some 85 cookies that were made for a small boy who was celebrating his 4th birthday. His mother liked the "Eat Me" cookies that I made and displayed on my site and requested for that design. Other than that, I was at a mental block on what design to do for some square-shaped cookies which she gave me the free-rein to design whatever way I wanted. Oh and by the way, I had no idea that the phrase "Eat Me" is actually part of Alice in Wonderland! When I wrote the words on the cookies, it was just an impromptu idea. Anyway, I had no clue what would excite a 4-year boy and his friends, whom I presume are about the same age. 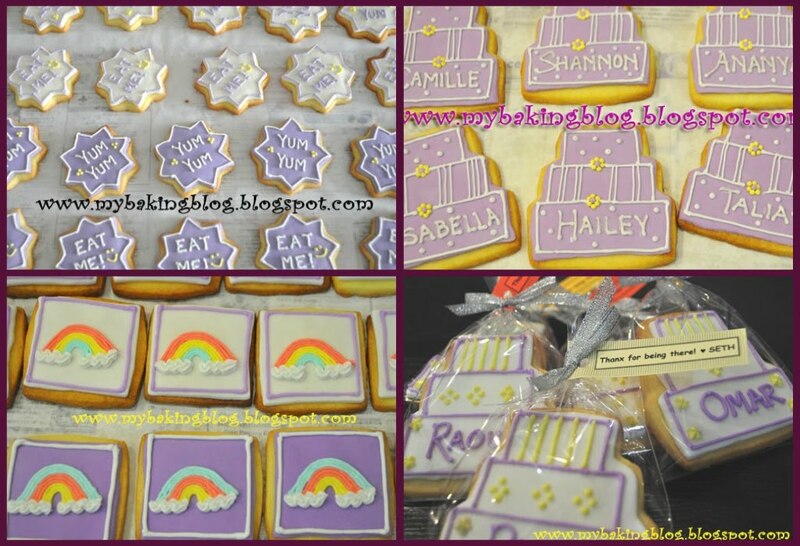 In the end, I drew a rainbow on each of the cookies. It wasn't a task that could be quickly done as the lines had to be drawn one by one. I was quite pleased with the cheerful colours at the end. I hope they had a great party and I hope they loved the cookies. 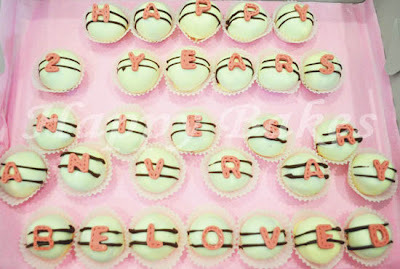 Some time back, I made some cake balls for a guy who wanted to surprise his girlfriend (or probably wife). This guy tried to place an order for Valentine's Day but it happened to be Chinese New Year on the same day and I couldn't find the time to do his order, so I had to reject him. To my pleasant surprise, he tried to place an order again in March, this time for his anniversary. Since I knew it was for his anniversary and it was going to be a surprise, I tried to make it prettier by lining the box with pink paper and tying the box with my nicer and more expensive ribbon. I can't believe that I actually forgot to take a picture of how the box looked like, and I contemplated on whether to blog about it or not because I am not pleased with the pictures I took of the cake balls. What made me finally decided to blog about it is that this guy wrote back to me that they loved the cake balls. In fact, he wanted to order them again yesterday, but I could not do it because my time was spent on the cookies. What a waste, I wish he would have some party again so that I can make more cake balls for him. A few weeks ago, I made a birthday cake for a sweet little girl. Her mother initially requested for a sponge cake with chocolate buttercream. After more discussions, she told me her daughter is "a chocolate freak". In the end, I made her a chocolate fudge cake, covered with chocolate ganache made with Varlhona chocolate. It sounds like a lot of chocolate but trust me, it was not overpowering nor too rich. 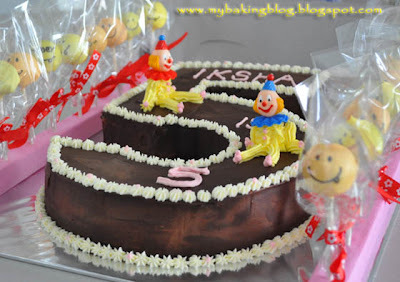 The cake, when refrigerated, tasted like really good and the ganache complemented it perfectly. 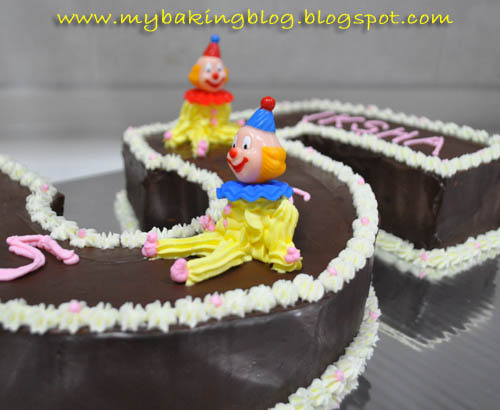 I decided not to make the cake look complicated, so I only piped the borders and 2 clowns. Her mother also requested for some cake pops, which I stuck them into styrofoam stands beside the cake. I always try to imagine my customers having a blast at their parties and I hope whatever I do added to the mood of the occasion. I always cross my fingers that when they open the box, it will be with a pleasant WOW. It really makes me happy to know that people actually like what I do. Meantime, here are the cake ball pictures that I am not so pleased with, because they were taken at night and I had to use flash instead of natural light. Hi David, thanks for visiting! The cake was a first time for me and I was so worried I could not pull it off and would spoil the little girl's party. It was some research and some luck involved and I when it was completed I was like "Whew!" Your cake balls are beautiful. Wow, this is amazing! I'm surprised at the big leap you have made. I must say you're really ready for business now! Those cupcakes I'd some time back were good for household eating but now you're ready to rake in some profits and make some kids happy with these.